Want The Ultimate Facebook Ad Template Library? Copy & paste these 7 proven Facebook ad campaigns to create low-cost, high-converting ads on demand. Get them here. As you’ll see in this case study, we changed one option in the Facebook Ads Manager and started getting leads for half the cost… but not on Facebook. Instead, our ads started to run (automatically) on Instagram. If you weren’t aware, Facebook bought Instagram in 2012 for about a billion dollars in cash and stock and they have since made it super simple to use the Facebook Ads Manager to advertise on Instagram. You’ll see the ads, ad copy, and the results (leads for $1.76 anyone?) we used in these “hybrid” campaigns. I say hybrid because these ads run on Facebook and Instagram simultaneously. I’ll also give you some pointers on getting started with your Instagram advertising. Our goal for paid ads has always been to present an offer for something free in front of an audience who would be thrilled to learn more. So, when Instagram ads became an option for us, we already knew what our strategy would be. 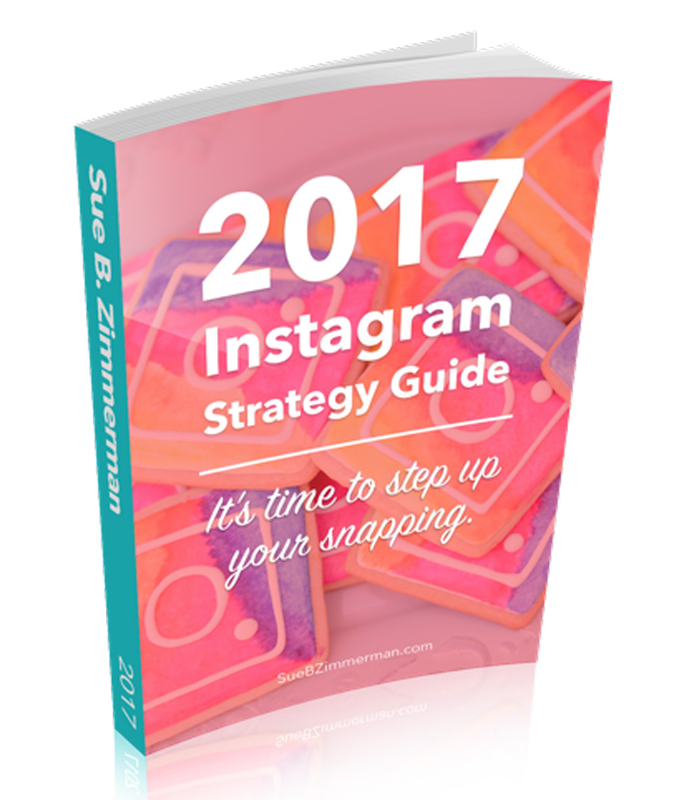 We have an Instagram Marketing Strategy Guide we use as a Lead Magnet and ran paid ads to it throughout the year. The guide acts as the very top of our sales funnel. Once someone opts into the guide, whether through a paid Instagram ad or a form on our website, they are brought through the same follow-up sequence of onboarding emails. During our last list building campaign, my team and I decided to test out results using Facebook’s “Automatic Placement,” so the ad was fed to all the placement options. This option is found under “Ad Set” when you are setting up your Facebook ads. By selecting this ad placement, your ad can be seen on BOTH the Facebook newsfeed and on Instagram. For this campaign, we spent $1,096.02 for 534 leads, an average of $2.05 a lead, which we were happy with. 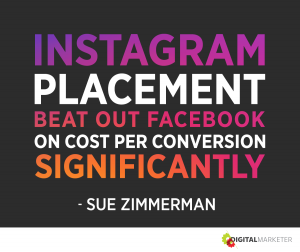 When we went back to the reports to analyze what made the difference, Instagram placement beat out Facebook placement on cost per conversion significantly. On average, a lead from an Instagram ad ran us $1.76/lead – 89¢ fewer than those shared to Facebook. It’s worth it for business owners to test BOTH platforms. We don’t only use Facebook and Instagram Ads for our lead generation, but also to directly convert sales. Two of our lower priced products, The Hashtag Handbook and Social Media Class Tickets, have sold well with Instagram ads. We served these ads only to warm audiences, retargeting the visits to our sales page. In a quick test of retargeting ads in January 2017, they converted at a cost of $8.77. With the Handbook priced at $27.99, that is a $19.22 return per sale. Any small business owner can benefit from running retargeting ads. Unlike the Instagram Strategy Guide ads from above, which can focus on cold and warm audiences, retargeting ads can take a lot less time to set up because it only requires setting up targeting once. Like we did with the Strategy Guide above, test your ads on both Facebook and Instagram. Running on both platforms is easy to set up and will help you target where your efforts should be spent. It turns out, these ads were super successful on Instagram and the actual cost per conversion was $1.09! With this information, I now can make a decision about where my budget is more wisely spent, and for this campaign it is Instagram. If you are going to test the two platforms for your retargeting ads, you can save yourself even more time by ensuring the ad copy you write for your description will work well on both platforms. On Instagram, only 300 characters of your description are visible, the rest is hidden behind a “read more” button. For example, in the Hashtag Handbook retargeting ad, you can see we come right out and tell people to stop wasting their time. The sentence tells our audience we want to help them get a precious resource back: time. The copy continues to explain the selling points of the handbook, which someone can view if they hit “More,” but to get them there, you need something to attract them in the first place. It is easy to test out where the copy on your ad would be cut off, take a peek at your ad and with “ad preview” in the Ads Manager or Power Editor. Nervous to invest in ads? 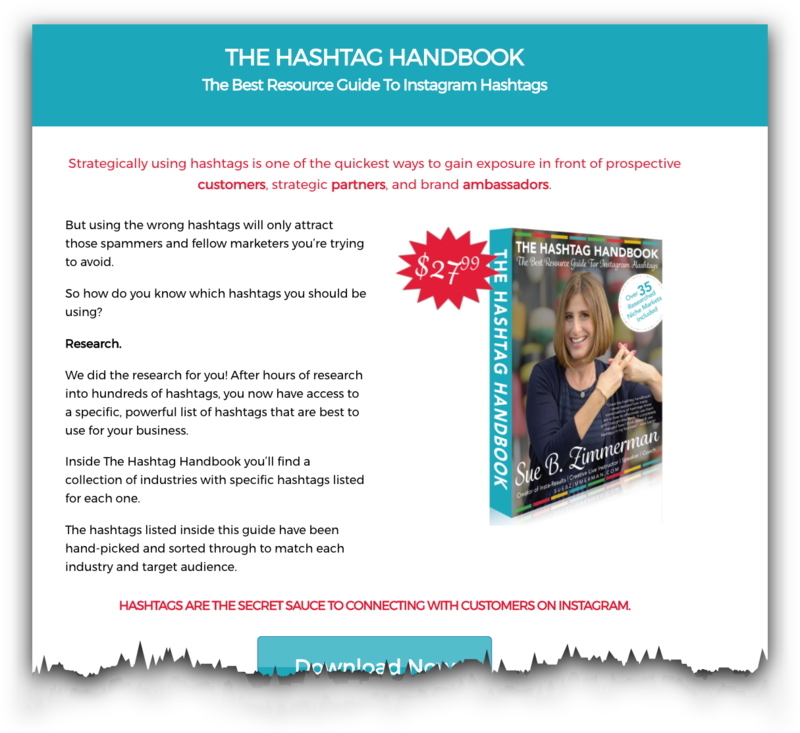 We ran the Hashtag Handbook retargeting ads for 3.5 days at $10.00 a day. This is an ad spend that anyone can afford, and at this pricing and conversion rate, you stand to more than double your investment in 7 days. You are also gaining increased visibility for your accounts when you are running ads, so the ad return is not just in cash earned but also in brand awareness and account followers. Remember, in order to retarget visits to a sales page, you need to add your Facebook pixel to the page and set up the Facebook custom audience to start collecting data. We suggest setting up not one audience, but two. The first is obvious: People who visit the specific web page. The second is an audience to use for exclusions. The purpose is to exclude people who decide to purchase your product from being served ads for a product they already own. The easiest way to do that is to create a second custom audience, one for those who visit your Thank You page. Anyone who visits that page is a customer of the product. When you create the ad targeting under your ad set, select your custom audiences, the first under “include” and the second under “exclude,” and you are good to go! Try out these tips to get your Instagram paid advertising off the ground. Sue B. is the #instagramexpert, creator of the online Instagram course “Ready Set Gram.” She's a popular CreativeLive instructor, powerful speaker on prominent stages like Social Media Marketing World and highly sought after business coach. She's passionate about teaching business owners and marketing professionals how to easily leverage the power of Instagram to get tangible business results. As a serial entrepreneur, Sue B. has 30 years of business experience, including SueB.Do, Boxer Rebellion and Sue B. Zimmerman Enterprise. With her extensive knowledge of social media it's Sue B. 's mission to teach, mentor and empower others to be highly successful entrepreneurs.